It has often been speculated that added sugars may be contributing to the obesity epidemic, thus resulting in an increased risk of several chronic diseases and metabolic disorders. While the link may not be so black and white, it is evident that diets with high amounts of added sugars tend to replace many essential nutrients that are found in more balanced diets. 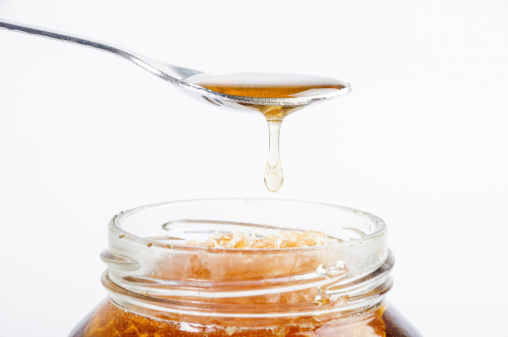 And a new study suggests honey is no better—or worse for that matter. Although added sugar intake has recently been on the decline, it is still a great concern among many public and private health agencies, which has led to several guidelines being put into place. For instance, the Institute of Medicine has recommended limiting your intake of added sugars to no more than 25% of your daily caloric intake. The American Heart Association (AHA) has more stringent guidelines, recommending women limit their intake to no more than 25 grams of added sugar per day, which accounts for about five percent of a standard 2,000-calorie diet, and men limit their intake to no more than 38 grams per day, about 7.5% of a 2,000-calorie diet. The most recent guidelines set forth by the 2015 Dietary Guidelines Advisory Committee, which thoroughly reviewed the evidence, state that added sugars should be limited to no more than 10% of total daily calorie intake, which is aligned with recommendations set out by the World Health Organization (WHO) for adults and children. Besides weight, consuming high amounts of added sugar is concerning to those with impaired glucose control and increased risk of developing type 2 diabetes. More so, excessive intake of added sugars has been linked to an increased risk of heart disease. And research has indicated that it can increase blood fats, also known as triglyceride levels, although there is no conclusive evidence linking high sugar intake to high blood pressure or chronic inflammation. However, while most people point a finger at high-fructose corn syrup (HFCS) and sucrose being the main culprits behind all these health detriments, you might be surprised to find out that honey has a similar chemical makeup. Honey has often been praised for its apparent health benefits, including its antibacterial, anti-inflammatory, and antioxidant properties. No study has compared the effects that all these compounds may play in terms of heart and metabolic health and diabetes risk—until recently. Researchers from the United States Department of Agriculture (USDA) Agricultural Research Service, Grand Forks Human Nutrition Research Center evaluated the health effects of HFCS, sucrose, and honey on healthy individuals and those with impaired glucose tolerance. The study was a randomized crossover trial of the three different sweeteners: sucrose, HFCS, and honey. This means that each of the 55 participants completed a trial with all three sweeteners. They were provided with 50 grams of one of the sweeteners daily for a two-week period and then were given a two- to four-week break until being evaluated for the next type of sweetener. Each participant was counseled by a registered dietitian to ensure that they had no other added sugars in their diet, including those from sugar-sweetened beverages like sodas. Participants had their blood drawn at the beginning of the trial and at the end of the two-week period of each sweetener. Blood samples were evaluated for triglycerides, inflammation, and glycemic response. Researchers also measured participants’ blood pressure and body weight. Findings revealed that there were no changes in body weight or blood pressure; however, it was a short trial period. Participants in the impaired glucose tolerance group had higher body weight, blood glucose levels, insulin inflammation, and total and bad cholesterol levels at the commencement of the study compared to the healthy individuals. The triglyceride levels had increased in both groups, regardless of the type of sugar consumed. The glycemic response, inflammation levels, and lipid profile resulted in similar outcomes between both groups for all the added sugar samples. Thus, none of the added sugars demonstrated any health benefit or detriment compared to another. In fact, all three demonstrated similar metabolic effects among individuals with either impaired or normal glucose tolerance. Raatz, S.K., et al., “Consumption of honey, sucrose, and high-fructose corn syrup produces similar metabolic effects in glucose-tolerant and -intolerant individuals,” The Journal of Nutrition 2015, doi: 10.3945/jn.115.218016, http://www.fasebj.org/content/29/1_Supplement/596.3.